What is it about the beginning of a new year that makes you want to quit bad habits, leave your negative past behind, and move forward focusing on the best version of yourself? Sort of like when you decide that you want to start a new diet but wait until Monday before you actually start. I guess the start of a new year represents a new beginning, a new chapter in the book of life. I firmly believe in setting goals at the start of the year to improve your life, whether they are personal, financial, career, or relationship goals. 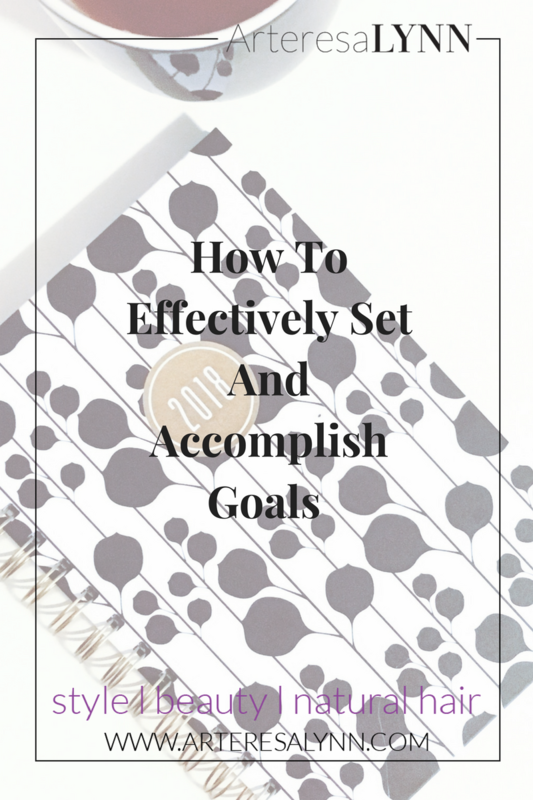 With that being said I'm going to share with you my tips on how to effectively set and accomplish goals. Specific - Your goal should be very detailed. For example, if you one of your goals is "To lose weight". I would challenge you to be more specific. How much weight do you want to lose? A more specific goal is "I want to lose 15 pounds". Measurable - This is why you need to be specific about your goals so that you are able to track them. Using the example from above, now that you know how much weight you want to lose you can measure your progress. Attainable - Of course your goals should push you out of your comfort zone but you want to make sure they are realistic. Relevant - Make sure your goals are relevant to you and what you're passionate about, not anyone else. Time-based - Your goal needs a deadline; this helps with procrastination. If you are struggling with procrastination (it happens to the best of us), I suggest you read my blog post on How To Beat Procrastination. Going back to the same example we have been using, a great goal would be "I want to lose 15 pounds by the end of March". You know that's 5 pounds a month that you have to lose to accomplish this goal; it's attainable and measurable. 1. Decide what it is that you really want to accomplish this year. Don’t be concerned with what others want for you, what do YOU want. You are more likely to achieve goals that are meaningful to you. Remember the acronym from above and set S.M.A.R.T goals. 2. Prioritize. Working on goals can sometimes be overwhelming depending on how many goals you set for yourself. You may even set goals for multiple categories in your life. It's perfectly fine to set quarterly goals; you don't have to work on all your goals at one time. 3. Break it down. Once you have your specific goal, break down into steps on how you plan to accomplish your goal. You can't just have a goal with no plan. 4. Give it a due date. Sometimes you have to say it twice for the people in the back. Giving yourself a deadline is crucial to accomplishing goals and giving it your all. You don't want to wait until November and not give it your best. 5. Get an accountability partner. This right here is a game changer IF you have the right partner. When you tell people your goals I feel like you have to stick with it because you have now put it out there and they are going to hold you accountable. I currently have an accountability and she is amazing! I told her my goal for this year is to post on my blog 3 times a week. I ran into a hiccup last week and told her I wasn't going to post that day and she got me together REAL QUICK. I ended up posting that day and 3 times last week. Check out her YouTube channel! She has great natural hair and inspirational lifestyle videos. 6. Revisit your goals. Whether it's monthly or quarterly you definitely want to check in with yourself and see where you're at with your goals. Maybe you need to reevaluate your plan of attack, maybe it's time for a celebration. Progress check-ins are helpful for staying on track. 7. Stay the course. Don't give up! You got this! It gets rough sometimes and life gets in the way. When that happens just readjust and get back to it. Having a great support system and/or accountability partner will really help during these times. I have many goals this year, both personal and business. However, my ultimate goal is to be happy and live my best life. Wishing the same for you all!